MySpace Music has completed its acquisition of most of the assets of music service iMeem. 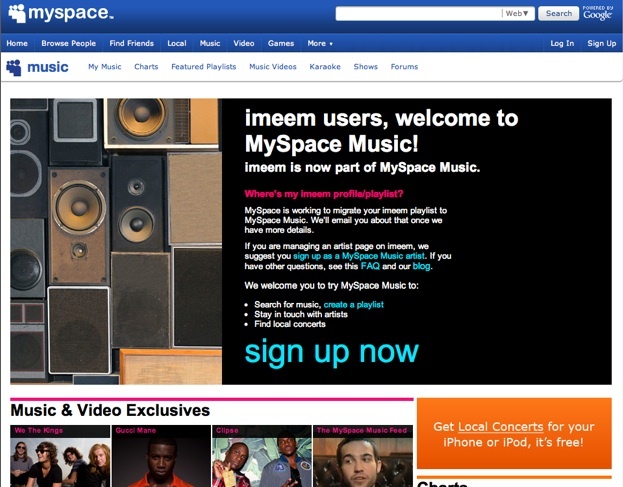 We first broke the news that MySpace was close to acquiring iMeem last month. Two days later, we reported that an agreement was signed to purchase the assets of the company for $1 million in cash. The deal didn’t close, however, because some of the assets MySpace Music was going to buy (namely, servers) were actually being leased. So that had to be worked out. And the final price ended up being less than $1 million, meaning MySpace Music is getting the iMeem brand and users for next to nothing. An additional earnout is also part of the deal, but it’s not much. Unlike the iLike acquisition, iMeem is being acquired by MySpace Music, not MySpace. MySpace Music is a joint venture between MySpace and the music labels. But now it is official. MySpace Music will be acquiring some of iMeem’s remaining assets and transition its 16 million monthly users over to MySpace Music. All of their playslist swill be migrated over, for instance. Founder Dalton Caldwell, CTO Brian Berg, COO Ali Aydar, and VP of Sales David Wade will oversee the transition on a consulting basis. It is not clear what will happen to IMeem’s other employees. Imeem now redirects to this landing page.